Timeline of world events since ISA’s founding, 60 years ago. Hot on the heels of my trip to London for the London Book Fair, I visited another country in the Commonwealth, heading up to Toronto, Canada for the International Studies Association (ISA) Annual Convention. For those of you not familiar with the ISA, it’s the world’s premier membership organization for researchers on topics of political science, globalization, international research, and more. Their mission is to connect “scholars, practitioners, and students across the globe,” and based on the diversity and representation within the panels and attendance of over 6,000 researchers at this year’s convention, the ISA delivers on this mission very effectively as they celebrate their 60th anniversary. Sessions and presentations covered topics related to specific current affairs issues, emerging methodologies in research and technology, diversity in research coverage as well as inclusivity within the research community, challenges to democracy, and much more. From my attendance, I can see a very interesting collection of new white papers coming from these policy groups in the months to come. Dozens of Westchester’s editorial and production clients were represented in the list of presenters and at stands in the Exhibit Hall, including Columbia University Press, Brookings Institution Press, Cornell University Press, The MIT Press, Macmillan Publishers, Princeton University Press, the United States Institute of Peace Press, W.W. Norton, The Cato Institute, and other policy groups and academic publishers. For Westchester, it was an opportunity to connect with a number of our clients and prospective partners to discuss how best our editorial and production services for the policy group and academic markets can help their publications programs, including the expansion of data visualization capabilities. For our clients, the ISA Convention provided a few different opportunities. For some of our clients and partners, attending was a branding exercise, as their international studies lists have grown in recent years and they wanted to highlight that to researchers in the fields covered by the conference presentations. For other publishers and policy groups, the convention allowed them to pursue acquisitions of new titles, papers, and projects by meeting with some of the most noted scholars in the foreign affairs and policy areas about potential projects. For other publishers, sales were brisk at their booths, where their lists of scholarly and policy related titles were in high demand by researchers and institutions looking to expand their reference libraries. 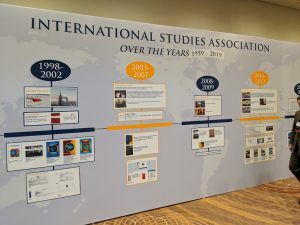 Next year’s ISA Convention will be held in Hawai’i, a destination that can sometimes be difficult for researchers to get included in their budget, but due to the impact of the conference on the global study of international relations and current affairs there is no doubt turnout will continue to be strong. Are you a publisher of academic or policy content, looking to explore ways you can expand your editorial, design, and production capacity, or reduce costs to produce your white papers, books, and journals? Contact us to learn more about how Westchester can help.